Lifeways of the Crow: the Peter W. Doss Crow Indian Artifact Collection explores the traditional daily life of the Crow people. Historically, the Crow lived in parts of Montana, Wyoming, and South Dakota, moving often throughout the region. The tipi, a portable home, was central to this nomadic way of life. In addition to providing shelter, it offered a place for children to play, women to work, and men to prepare for the hunt. Included in this exhibition is a model tipi and objects that would have been found inside: parfleches for storing possessions, a drum for evening entertainment, and a backrest for relaxing. 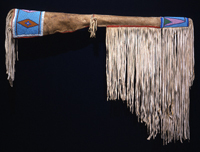 Lifeways of the Crow presents a selection of objects housed at the University of Wyoming Art Museum in the Peter W. Doss Crow Indian Artifact Collection. Heywood and Marylou Big Day of Pryor, Montana, have served as consultants for the exhibition. The Peter W. Doss Crow Indian Artifact Collection is comprised of more than 400 objects collected by Peter W. Doss of Billings, Mt. It is on extended loan to the UW Art Museum. Funded in part by Chevron Companies and the National Advisory Board for the UW Art Museum.